Tritch told more than 30 supporters that she is not an expert on her three campaign planks – public education, clean energy and health care – but that she would seek expert advice on those and other issues if elected. “And that is the type of problem-solving we're not getting that needs to change” in Congress, she said at Three Crowns Coffee in downtown Warsaw. Tritch, a Fort Wayne marketing consultant who seeks the Democratic nomination in northeast Indiana's heavily Republican 3rd District, noted that she raised more in campaign contributions than the lawmaker she hopes to unseat, freshman Republican Rep. Jim Banks, during the last quarter of 2017, a comment that drew applause from her audience. Tritch raised more than $101,000, compared with about $90,500 for Banks, according to campaign finance reports filed with the Federal Election Commission. “There are a lot of people who said this can't be done,” Tritch said, adding that all of her money had come from individual donors while Banks had accepted contributions from political action committees. “This campaign is about how do we take 2018 back for ourselves, for people in this country, because I don't think it is hyperbole that there are parts of our democracy I am really concerned about right now,” she said. As she has at other campaign events, Tritch labeled herself a fiscal conservative and social progressive who had been a political independent before deciding to run as a Democrat for a U.S. House seat. After speaking for about 15 minutes, she spent the remainder of the event mingling with people in the coffee shop. Tritch's listening tour began Tuesday in Huntington and will stop in each of the counties in the 3rd District ahead of the May 8 primary election. Her rivals for the Democratic nomination are Fort Wayne residents John Roberson and Tommy Schrader, perennial candidates who have done no fundraising and little if any public campaigning. The district has not elected a Democrat since Jill Long in 1992. Banks, a former state senator from Columbia City, attracted 70 percent of the vote in the 2016 general election – including 77 percent in Kosciusko County, which is split between the 2nd and 3rd districts. 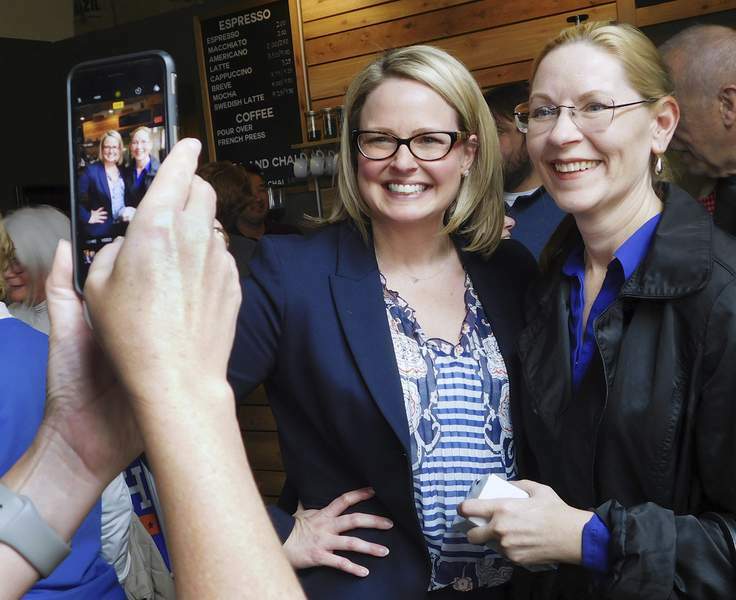 “I can't promise you that I can win the county for her, but I can get her 35 percent of the vote to swing enough to bring her to victory in the fall” for the entire district, Smith said. No Democratic congressional candidate has topped 22 percent of the Kosciusko County vote since redistricting took effect in 2012. The candidate in the last mid-term election received only 14 percent of the county vote. To face Banks, Tritch would first have to win the Democratic nomination. Schrader captured it in 2016 despite the Democratic Party organization's endorsement of Todd Nightenhelser. “We kind of dropped the ball on our candidate; we took for granted that he was going to win the primary, and it didn't happen,” Smith said. “And we're not going to make that mistake this year. We're making sure that Courtney is in every county.